Virgin Atlantic has unveiled its new Upper Class suite, which is now available on A330 flights VS003 from Heathrow to New York JFK and VS004 back to London. The new seat, upholstered in “espresso coloured leather”, is still configured in herringbone layout (albeit with a staggered configuration in the middle of the aircraft – see the image below), but features an increase in width of 1.5 inches (with an armrest which now flips down from the side of the seat, similar to a fold down cocktail table mechanism), and 50 per cent more recline when in the seated mode. The carrier has also retained the flip-over functionality to convert its seat into bed mode (meaning passengers will still have to get up from their seat to convert it into a bed, as shown in the video above), but the bed is now 87 inches in length, which Virgin says is “longer than any other airlines business class bed”. Other new features include inseat power “compatible with most international plug types”, a flip-down cocktail table, “a new fully adjustable reading light and a much more conveniently located headphone jack”, as well as “a new literature pocket and two ottoman storage solutions”. The carrier also says that “A new window has been built into the wall of each suite, giving you more light and space, but its unique opaque design offers the same levels of privacy our Upper Class Suite is famous for”. Virgin’s new A330 aircraft also feature the carrier’s latest IFE system (for more information click here), and passengers will also be able to make and receive mobile phone calls in flight. Virgin has also made the decision to separate its onboard bar from the Upper Class cabin, with features including stools and a bar backlit in red. The carrier says the new bar is “the longest in the sky” at 2.5 metres, with space to accommodate up to eight people. The airline says that the new seat will be fitted to its forthcoming Boeing Dreamliner aircraft from 2014, and more A330 routes with the new offering will be added throughout this year as further aircraft are delivered. 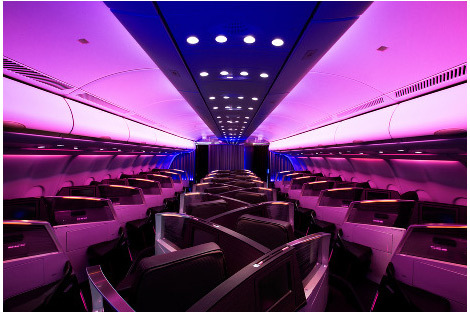 A website has been created at virginatlanticplaneview.com, where customers can explore the Upper Class suite, including 360-degree views of the cabin and around 40 You Tube videos showing different aspects of the new seat and bar. For more information visit virginatlantic.com. Business Traveller will be attending a press trip to experience the new Upper Class suite next month, and will report further following the trip.